Unique oval pendant necklace with an engraved illustration of a tree of life, makes this Sterling Silver Kaballah amulet the perfect symbol for fertility and abundance in all aspects of your life. The artists of Ma'ase B'Omanut Jewelers created this sterling silver Kabbalah amulet using many techniques to paint a unique picture: You can almost feel the strength and texture of the wood on the tree carved here, with deep dark etchings around it to bring out the relief. The entire background is hammered with tiny lines giving the impression of flowing water behind the tree. 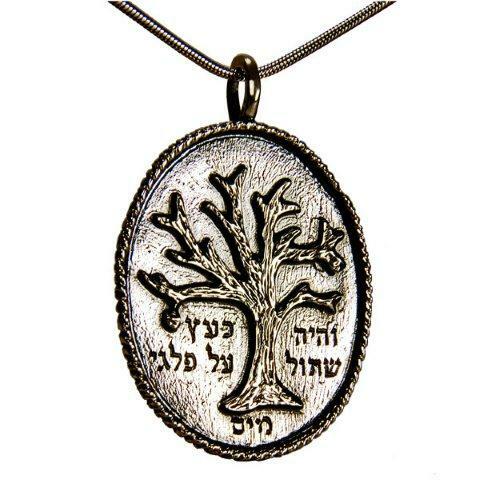 The base of the tree is surrounded by a quote from the third verse in the first Psalm: 'And he will be like a tree planted by flowing brooks': The entire oval shape is surrounded by an ornate silver design which further embellishes this amulet. The oval is hung with a smooth silver hook onto a sterling silver necklace. This first Psalm in the book of Psalms, in its very first few verses, compares a righteous person who stays away from trouble to a tree planted right next to flowing water. The Psalm continues to say that such a tree gives fruit on time, does not lose its leaves, and succeeds in whatever it does. This wearer of this amulet can use this parable as a symbol for the success, fertility and abundance which can come to those who follow the righteous path. Kabbalah interprets this verse to mean that if you put your good deeds in helping other people before your own private betterment, then you will naturally better yourself. This amulet by Jewlery Tales Studio measures 1.57 inch x 1.37 inch (40 mm x 33 mm).